I had gotten 16 inch ones for $17 bucks a piece. These new ones are 26 inch ones at $35 bucks a piece. This will raise the height of the oven by 5 inches, it also means getting a new axel. 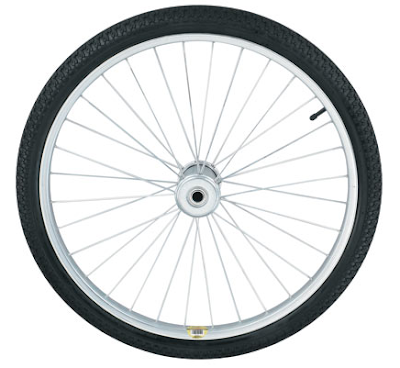 This larger wheel has a 3/4 " bearing. I did this for several reasons . The most important being , that it will add to the summer angle of the oven. By raising the rear end of the oven with larger wheels, the oven will tip even farther back. The next one is it will add in the comfort of working the oven. And thirdly , it will just look better. Made a new axel carrier, added another 5 inches to the height of the oven frame. Much better setup. Sorry, my batteries die at the end. 60 or so more seconds.